The Export to Flash Movie dialog box lets you export your animation as a Flash (.swf) movie. For tasks related to this dialog box, see Exporting Flash (SWF) Movies. Lets you specify the location in which the file will be exported. Exports all the frames of your movie. Lets you enter a Frame rate (fps). By default, it will be set to match the fps of your Harmony project. 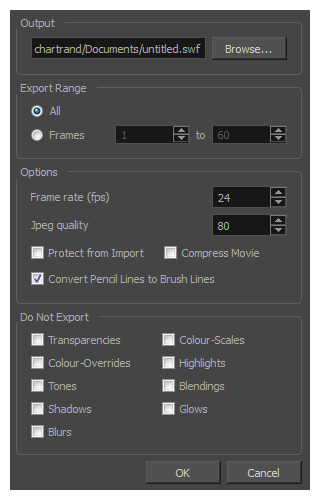 If you choose a lower frame rate, your export playback will be faster than your actual project. The reverse is also true for a higher frame rate. Prevents the movie from being imported into another application. Retains the thickness of pencil lines. Compresses the movie for a lighter format. The movie may lose some quality, but the file will be lighter. Lets you select the effects you do NOT want to be rendered in the SWF movie. NOTECertain Harmony effects are not listed in this section as they are not compatible and therefore not available for SWF export. These effects will not appear in the SWF render.